LAUSANNE • Germany will face old rivals France and the Netherlands after the trio were drawn together in the same three-team group for the inaugural Uefa Nations League yesterday. The three will feature in Group One of League A, the top division of the four-tier tournament - which features all 55 of Europe's national teams - that Uefa has introduced to replace international friendlies. Uefa, concerned that international football is losing popularity to the club game, has said that the league will provide the top nations with more competitive matches against each other. However, critics say the competition, which starts in September after the World Cup, is too complex and adds to an already overcrowded calendar. Italy, who failed to qualify for Russia 2018, will face European champions Portugal and Poland in Group Three while Spain take on England and Croatia in Group Four. Belgium will meet Switzerland and Iceland in Group Two. The winners of each group qualify for the semi-finals, which will be played in June 2019, followed by the final. The bottom four teams in each group, meanwhile, will be relegated to League B. League B also consists of 12 teams and will operate a similar system to League A. The second tier brings a clash between neighbours the Czech Republic and Slovakia in Group One. Ireland must face Denmark, who beat them in last year's World Cup play-offs, in Group Four, which also features Wales. The four group winners will be promoted to League A and the bottom team in each group relegated to League C.
Leagues C and D will use the same format as the top two leagues but with more teams. League C will consist of 15 teams split into one group of three and three groups of four; League D will have four groups of four. Although the new competition is played in addition to the European Championship qualifying competition, which will go ahead as usual, it provides a back door to Euro 2020 with one team from each league earning a place at Uefa's flagship tournament. 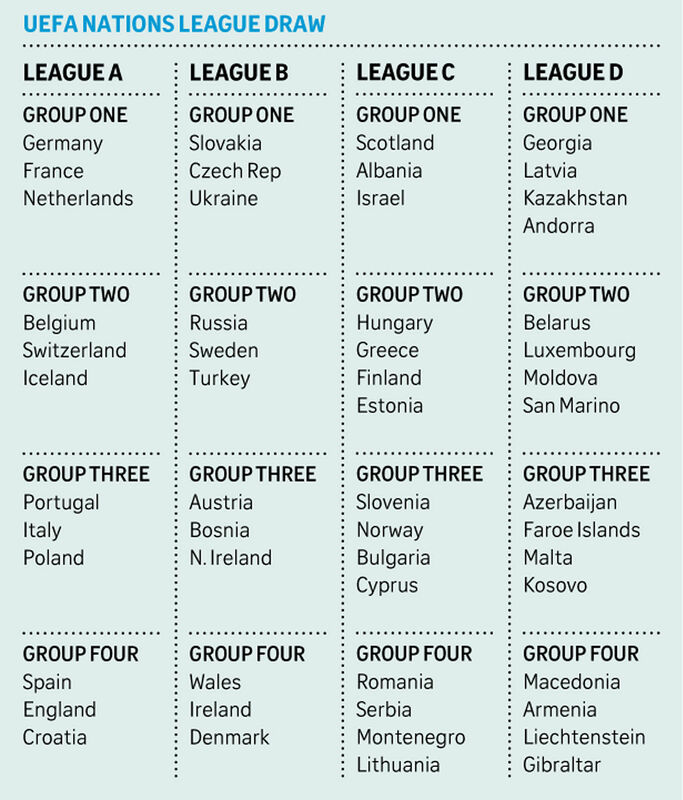 In March 2020, nine months after the first Nations League has finished, the top four teams in each league who have not already qualified for that summer's European Championship will be offered another bite of the cherry. They will enter a play-off round among themselves, with one spot guaranteed for each league.